Florida, California, Montana and Georgia have joined the Plant Something marketing campaign, bringing the total number of participating states to 18. The Arizona Nursery Association created the program, and in 2012, Oregon Association of Nurseries became one of the first state nursery associations to adopt it. Plant Something was created with one purpose in mind — to inspire novice and experienced gardeners to make plants a bigger part of their lives. It’s hoped this will boost plant sales in retail garden centers and for wholesale nurseries. Jessica Baron, a fifth-grader at St. Luke Catholic School in Woodburn, Oregon, created the artwork that is featured on the 2014 Plant Something calendar. Her painting of flowers in bloom and buzzing bees was chosen from more than 70 submissions. As a Plant Something licensee, OAN provides its members an array of Plant Something marketing tools, including logos, button artwork, ads and posters, brochures, and vehicle wraps, among other items. Using these tools, member retailers can create Plant Something promotions in their stores, particularly useful during slower sales seasons. 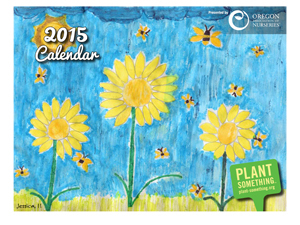 This past month, OAN posted a Plant Something-themed 2015 e-calendar featuring artwork created by Oregon elementary schoolchildren. OAN members are encouraged to link to the calendar via their Facebook pages and websites to help spread the Plant Something message.